Moody guitar driven post punk rock for people who like to think and feel. Melbourne, Australia's Feverdream have been compared to a cyclone and it's easy to hear why. From the stand out track "No Stone Unturned" with its dreamy, cryptic melody to "Wide Awake"
and its jagged, in your face edginess, it's no wonder Rolling Stone Australia likened them to a "crackling stockwhip". on vocals and the guitar attack of Swervedriver. 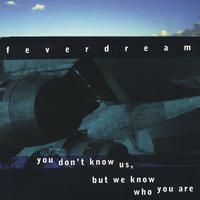 Since 1993 Feverdream have taken Australia by storm. From their first release, a five song E.P. entitled Initial, they have been gathering critical raves from zines such as Dark Angel and Permission to more mainstream publications like The Melbourne Times and even Rolling Stone Australia. Their rich diversity of sound and texture has made Feverdream hard to define. At times they can thrash their way into your head with their post - punk poetry, and on the next track carry you away into a dark nether world with their ambient soundscapes. With their second release, a full length CD called Somewhere Elsewhere, the critical raves poured in as before. At this time radio took notice as well, and SPBS, RRR, JJJ and even the BBC put Feverdream into their rotation. After extensive touring throughout Australia, they made their way back into the studio to record what fans and critics alike have described as their best album to date - Moniker. A kind of summation of their style and sound, from haunting moodiness to all out white noise guitar assaults, it quickly became their best selling release. Not a bunch to rest on their laurels, they embarked on an even more intense series of live shows. With the release of You Don't Know Who We Are, But We Know Who You Are, Feverdream have set their sights on conquering the world. Featuring some of the best tracks from Somewhere Elsewhere and Moniker, as well as new and previously unreleased material, You Don't Know us... is a great introduction for new fans and a great addition for the long time followers of Feverdream.